So the question is what printer is best for use in the photo booth? First of all let’s go ahead and put the inkjet printer question to rest right now. We do not recommend ink jet printers. Inkjet printers have proven to be unpractical for Photo Booth applications because they are slow and very expensive when it comes to paper and ink. One important detail about photo booth printers. In our opinion the printer must have a 2x6 print option (4x6 cut in half). This is very helpful when photo strips are the choice of your client for the photo booth rental event. Technically the traditional photo strip is what people expect from the photo booth. Instead of manually cutting the 4x6 which will take time and the manual cut will not be perfect. If your printer will cut 4x6 for you it will be absolutely precise and will save you a lot of time and extra work. All of them delivered outstanding image quality, affordable per print cost, fast printing speed, durability, and the 2x6 printing option (4x6 cut in half). So it is safe to say that any of these printers will make your photo booth printed images a high quality product. When you are choosing a printer for your photo booth, the choice of which model to purchase will mostly depend on your photo booth enclosure design. Each printer will have different dimensions, weight, and print delivery system (paper tray). Based on your photo booth enclosure design you will have to plan how the printed pictures will be delivered to the customer. For example: We wanted the pictures to print inside the photo booth. To achieve that we designed a custom aluminum paper tray so the printed pictures will fall at a certain angle and drop into a picture box that has been mounted into our photobooth enclosure. 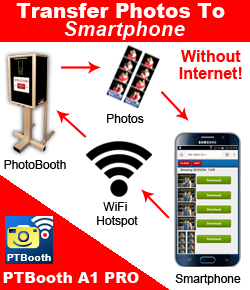 The pictures delivery system you are planning to use most likely will impact your choice of photobooth printer. Preferably you will want to purchase your printer new. However there are also second hand/refurbished Dye Sub printers available. We started our photo booth business by using refurbished Sony UPDR 150 printers. We bought some of them on Ebay and others we purchased from our printer supply company. As we continue to grow we have started to buy NEW printers only. It is imperative to protect your printer and all your other devices as well. When choosing your printer you should ask yourself how you are going to be transporting the printer. This is very important because your printer is the most expensive and somewhat irreplaceable component of your Photo Booth. Unless you have a back up printer (which is ideal) you must take all necessary precautions to make sure it will work when you arrived to your photo booth rental. Search around and get yourself a hard transportation case. These cases can be expensive but it is 100% worth it to spend the extra money while at the same time giving yourself peace of mind knowing that your printer is protected. TIP: always transport your media (paper and ribbon) separately from the printer. When looking for a printer you should start your search online. Look for a good price and make sure you find a reliable source for your media supply. We recommend buying from companies with good reputations in the business. Ultimately the choice is yours. Good luck and remember to never skimp when it comes to choosing and protecting a printer for your photo booth. We hope this article will help you to make sound decisions when it comes to buying and using printer for your Photo Booth.